Athlone’s Jordan Marshment, renews rivalry with neighbours Garrycastle in the Westmeath SFC quarter final on Sunday. Photo by AC Sports Images. When the need was greatest Athlone delivered in splendid style earning a commanding 5-11 to 0-8 triumph over Killucan. Emmett McDonnell’s outfit were completely aware of the importance of the match as Mickey Greene’s goal set the tone. Greene subsequently added a second major for a pumped up Athlone team, who were in the ascendandy. Jack Quinn struck a third goal for Athlone, who went in at the interval armed with a significant 3-4 to 0-6 advantage. Danny Reid’s opportunism led to Athlone’s fourth goal and Ryan Gaffey sealed the deal with a tidy finish. In the closing stages Jordan Marshment and substitutes Richie Greene and Dermot Bannon clipped scores for Athlone, who will face a much tougher test against Garrycastle. Tyrrellspass maintained their impressive form with a convincing 3-8 to 0-12 triumph over The Downs. Though Alan Giles bagged a brace of goals, Coralstown-Kinnegad were still beaten 2-8 to 2-5 by holders St Lomans. 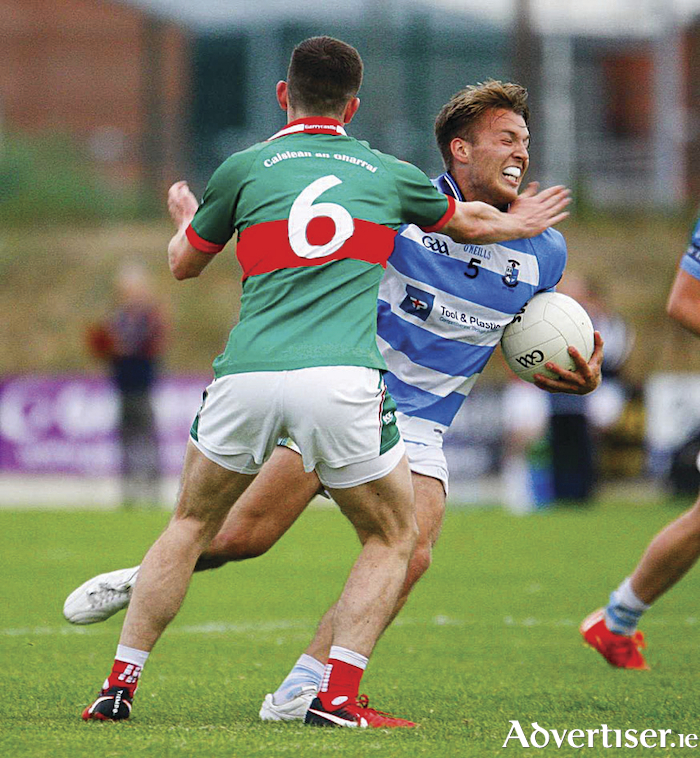 Despite being forced to start without the injured Ger Henaghan and John Gaffey, Garrycastle still proved far too strong, 4-20 to 2-5, for Maryland at Tang on Sunday evening. Dessie Dolan returned to the Garrycastle team and even though Kieran Martin planted an early goal for Maryland, the favourites then seized control to ease their way into the knockout stages. A James Dolan goal was an important response for Garrycastle, who were dominating. Alex Gardiner and James Dolan added further Garrycastle goals as Maryland were in deep trouble with the winners 3-12 to 2-2 ahead at the interval. Substitute Jason Nugent netted a fourth Garrycastle goal as they set up a fascinating quarter final meeting with Athlone. Mullingar Shamrocks did what was required to earn their own place in the next stage by defeating Rosemount 0-11 to 0-9. The prize for that Shamrocks success is a clash against The Downs at Cusack Park on Sunday. Tye Adamson and Dean Moore were prominent for Shamrocks contributing six points between them, while Patrick Fagan also made an impact. Trailing by four at the break, Rosemount battled until the end, but Deccie Mullen and Sean Petit’s efforts weren’t enough as Shamrocks prevailed. Jordan Nugent’s late point ensured the spoils were divided between Castledaly and St Mary’s, Rochfortbridge, who drew 1-11 each. Kevin Stone’s goal 10 minutes from the end put Castledaly ahead, but Rochfortbridge stayed defiant to claim a point. Jack Cooney is delighted to be the first Westmeath native in 26 years to take charge of the senior football team in the county. The highly regarded Cooney, who has carried out impressive coaching work at a number of clubs in Leinster, was ratified as the new boss of the midlanders last week. “It is always special to be involved and to train with your own county. A lot of coaches that have come in over the last number of years have been excellent coaches and have contributed an awful lot to Westmeath football. You can’t go without saying that either. “This time around I’m lucky to get the nod and I’m getting a lot of support from the Westmeath supporters so hopefully that will continue. I’m just really looking forward to getting stuck into it now to see where we can take the team,” the new Westmeath supremo acknowledged. Paschal Kellaghan, who has enjoyed success with Rhode in Offaly and recently trained the Tipperary footballers will join Cathal Mullin in Cooney’s backroom. “Cathal Mullin is coming in, he played between the sticks for Westmeath for a number of years. He had a long and distinguished career with Garrycastle in the goal, he is coming in as part of the management team, as a goalkeeping coach, so we can’t wait to get stuck into it,” Cooney concluded.